Details about 12 MECCANO NEW PARTS ANGLE GIRDERS 7-1/2"- ZINC! 12 MECCANO NEW PARTS ANGLE GIRDERS 7-1/2"- ZINC! Meccano Erector Special Edition - Big Ben #0522 / 830522, Rare, Sealed! 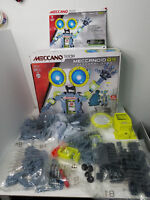 Meccano Meccasuar Programmable Robotic Dinosaur T-rex dino robot PARTS ONLY !! !